This entry was posted in Microsoft Student Partners and tagged Microsoft Student Partners, Party on 28. December 2010 by Daniel. This entry was posted in Community and tagged Community, Party on 7. November 2010 by Daniel. Diesen Freitag findet wieder die legendäre FH Party am Campus Gummersbach statt! Alles Infos findest du auf dem Plakat! This entry was posted in Studies and tagged Party, Studentenleben on 8. June 2010 by Daniel. This entry was posted in Studies and tagged Party, Studies on 14. April 2010 by Daniel. 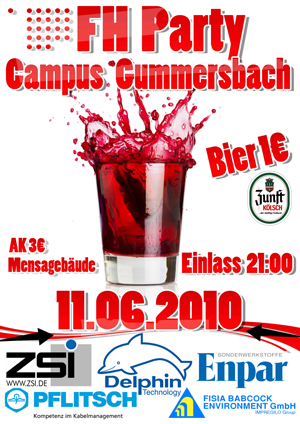 Pünktlich zum Jahresende findet am 11.12.09 wieder die FH Party des Campus Gummersbach statt. Um 21:00 Uhr geht es los! This entry was posted in Studies and tagged Party, Studentenleben on 2. December 2009 by Daniel. This entry was posted in General, Microsoft Student Partners and tagged Microsoft Student Partners, Party, Studentenleben on 24. October 2009 by Daniel. This entry was posted in General, Studies and tagged Party, Studentenleben on 16. October 2009 by Daniel.